Whisk egg yolk n sugar in a bowl till combine. Gradually add in coconut oil, coconut milk and pandan juice n salt. Mix well with egg yolk till fully combined. Sieve in flour and mix. Do not over mix. In a separate bowl, whisk egg white until foamy. Add in sugar in 3 addition. Beat till stiff peaks form. With a spatula, gently fold the egg white into the egg yolk batter ( in 3 addition) just until blended. 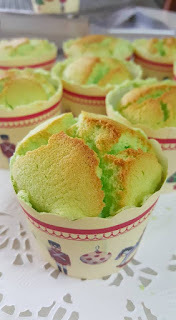 Pour the batter into individual cuppies n tap on the table to get rid of any air bubbles trapped inside. 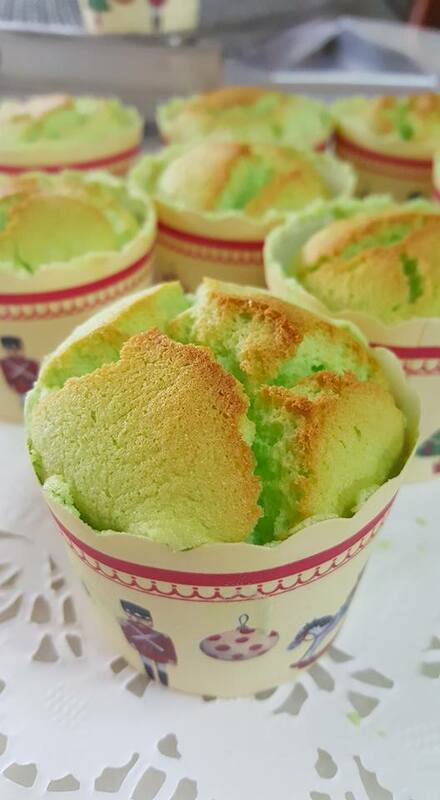 Bake in a preheated oven for about 20 to 25mins or till cooked on a temp of 160deg. You can inserted a toothpick to check if the cake is fully baked when it comes out clean.